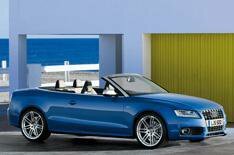 Audi launches S5 Cabriolet | What Car? Audi's S5 Cabriolet will cost from 42,245 when it goes on sale in October. A 328bhp supercharged 3.0-litre V6 petrol engine powers the S5 and a seven-speed S tronic semi-automatic transmission and quattro four-wheel drive come as standard. This is in contrast to the S5 Coupe, which has a 4.2-litre V8. Audi says that the S5 Coupe will also get the V6 engine at some point in its production lifetime. The Cabriolet does 0-62mph in 5.6 seconds - that's half a second slower than the S5 Coupe and has a limited top speed of 155mph. Average fuel economy is 29.1mpg, while CO2 emissions are 224g/km. The roof lowers in 15 seconds and takes 17 seconds to go back up. Both functions can be completed at speeds of up to 31mph.